The latest release of LibraryAware includes a much-requested feature: the ability for administrators to customize templates. This feature gives your organization the power to customize layouts with content, photos, fonts and colors and then save the template for your organization. Customers requested this feature so that they could create templates that exactly match their unique design needs. This release is scheduled for the week of June 17. Publication schedule: Provides, at a glance, a look at the upcoming items that have been scheduled for release. Filters and tools on the page make it easy to manage all publications from one place. 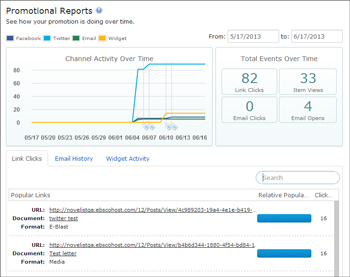 Promotion reports: Displays expanded metrics for each promotion, including clicks, views and opens. Widget contents: Displays the contents of each widget and makes it easier for users to see and manage all the slides from one convenient location. Three new formats are also now available: postcards, wide bookmarks, and rack cards. Some examples of these items, and others created by LibraryAware customers, are pinned on our LibraryAware Designs Pinterest board.